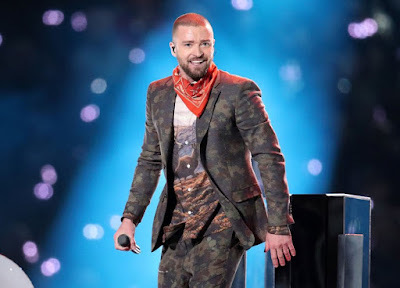 Just momeents ago, Justin Timberlake headlined the Super Bowl Halftime Show, where he delivered a dance-heavy medley of his biggest hits. The performance included a tribute to Prince, which saw JT duetting with the late icon as footage of Prince was projected onto a curtain. Minneapolis is Prince's home town so it does make sense, and JT's sophomore album had some serious Prince influences. He dissed Prince in a song back in 2007, but when push comes to shove, always respect the legends. As for the performance, he did alright. It was nothing spectacular and didn’t have me jumping out of my seat or anything, but I did enjoy his walk down memory lane. It showed he has some really good records.